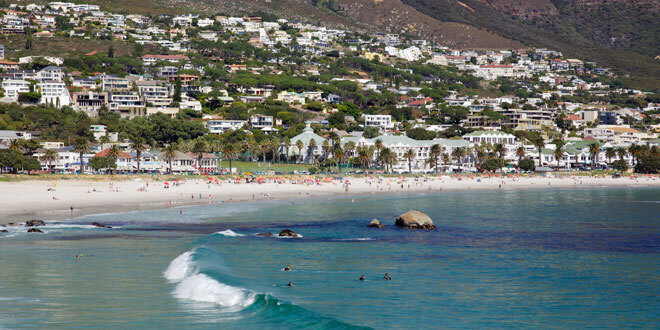 Camps Bay is an affluent neighbourhood at the foot of the 12 Apostles Mountain Range, behind Table Mountain. It is famous for its exquisite variety of restaurants, pavement cafés, champagne bars, clubs, boutiques, galleries and more. However, it is, perhaps, even better known for its gorgeous beaches, which stretch the entire length of the neighbourhood and beyond. White sands are tickled and lapped by the turquoise and blues of the icy Atlantic Ocean, and many of the beaches are lined by palm trees or rocky mountain faces, giving the beaches a tropical, impressive appeal that is quite unique. Being situated so close to the hub of Camps Bay, and only a 10-minute drive from the City Bowl of the Mother City, the beaches of Camps Bay are easy to access, and make for the perfect day out in the South African summer sun. This beautiful beach has achieved Blue Flag status, which is an international accreditation based on its conservation, beauty, safety, swimming conditions and educational initiatives. It is characterised by pristine white sands and palm trees, and is situated right across the road from the trendy attractions of Camps Bay. It boasts magnificent views of the 12 Apostles Mountain Range, and is a very popular beach for the who’s who of Cape Town. This beach is just off Camps Bay Beach, but is concealed by the large boulders. Glen Beach is a favourite amongst Cape Town’s surfers, especially those that love fast waves. It is, as a result, vibey and inviting. This beach is known especially well among divers, who love to explore the remains of the scrap vessel, the Romalia, which sunk here in 1977. This beach is also known as Witsand. More than for its actual beach, Koeël Bay is particularly popular amongst tourists as it is home to an open-air African curio market. Here, they are able to see and purchase handmade items from all over the continent, and interact with local artists and crafters. This is also a fabulous surfing hotspot, and the waters are often occupied by loyal surfers, regardless of the weather. Home to the local sea rescue station, Bakoven is a great swimming beach, despite there being very few areas that are sandy, as opposed to rocky. It is secluded and fairly private, great for those wanting to relax away from the madding holiday crowds. This conglomeration of small beaches is popular for braais, picnics and relaxing with family as they are sheltered by massive boulders. There are tables and benches here, as well as public ablution facilities. This is a great option for family get-togethers or corporate functions. Whenever you spend time outdoors, especially during the summer months in South Africa, it is essential that you protect your skin against sunburn. Wear a high-factor, good quality sunscreen as well as light cotton clothing that covers your arms and neck. A wide-brimmed hat that protects the face and neck is also advisable.